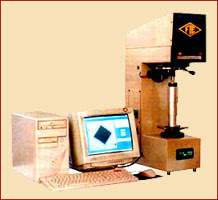 • Fully Computerised (PC Based) Vickers Hardness Machine. • Direct and accurate measurement of Vickers Hardness Number using "State of Art" image processing technology. • 'Wide testing range' : from soft metal such as lead up to medium hardened steels. • High accuracy and repeatability of measurement at all loads. • Faster measurement yielding to higher productivity. • Small size of indentation makes it a non destructive testing on finished components. • Motorised loading and unloading cycle. • Small loads allow testing of thin sheet metals. • Advanced Window 95/NT based software. • User friendly software with all help file and Window Features. • Online indentation setting and focusing on PC monitor. • Advance image processing : Algorithms implemented for precise calculation of hardness numbers with various options to cover all ranges of specimen. Option for data/storage and reports generation. • Wide options in calibration mode. The robust machine frame is gesigned to accommodate the high precision loading.Specimen is placed on a festing table. The test cycle is fully automatic. The accurate load is applied on a diamond indentor by means of a lever and weights. After a specific image is igitized using a CCD camera fitted on the indentation are automatically measured by PC to given the Vickers Hardness Number.